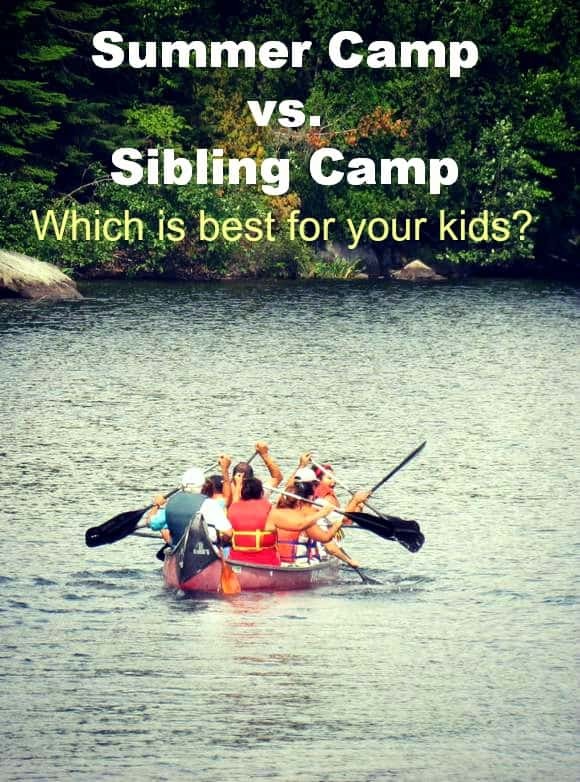 Parenting Tips: Should You Choose a Structured Summer Camp or Sibling Camp? With only few weeks to the school year ends, many working parents-like me-are looking for summer camp options for their kids. Not everyone can afford to take 8 or 9 weeks of vacations. This year my son turns 13 and I am investigating the idea of a sibling summer camp for my 6 year old daughter (Note: this is not a new camp: it means my son will be babysitting his sister. I just came up with this expression: Sibling Camp). But then, I wonder if a structured camp would be better? Which to choose? I created a table to offer parenting tips and come to my own decision based on the pros and cons of each choice. A structured summer camp is the more traditional route for many parents. It’s also the more expensive route. In a sibling camp, your older child helps take care of the younger one. In our case, I would supervise but he would be responsible for entertaining and keeping an overall eye on her. She will be with other kids her age: lets face it, my son will not play with her all day. He is 13 and she is 6, he is a boy and she is a girl. She can play lots of different activities whereas at home she will have less activities to choose from. She’ll have the chance to learn new skills that I may not even know about. It is expensive. Summer camps in our areas cost between $150 and $200 per week. That does not include meals nor snacks. It is lots of structured play: it does not leave room for child’s freedom to play or unstructured play whereas at home she can play with her toys and let her imagination run wild. She will get sick less often. My daughter caught mono last year and since then she is fragile and picks up every bug that is around her. It’s a huge responsibility for my son. I will be around at home to supervise a bit but still. My son is a night owl and my daughter is not. He will have to wake up early to take care of his sister. Lets not forget that he wakes up early during school and has to commute for an hour every day. Its my son’s summer vacation though and I don’t want him to feel overwhelmed by this. My daughter will say the magic words “I am bored” and will be sticking next to my office chair, making it hard to get work done. Which decision should I go with? Even with these parenting tips and pros and cons, its a tough decision for a work at home mom or any working mom to choose between sibling camp or a structured summer camp. But given that my daughter was sick all year long, given that she needs some rest and some unstructured play, I decided to go with a sibling summer camp. But I will be adjusting my working hours and will be working from early morning till early afternoon so my son can go and have fun with his friends. If you do opt for more structure, check out our tips for choosing the best summer camp for your kids. Plus, make sure you learn how to prevent bullying in summer camp. Which option would you choose? Or which summer camp option would you choose? Do you have any parenting tips to help make the decision easier? Let me know in the comment section. My kids don’t have the spacing that would allow for this. My daughter has been doing summer day camps and just did her first lock in. Next summer she will do her first week long over night camp. You are welcome Pam. What a great idea: an overnight camp. I am sure your oldest would love it. Mine tried that 2 years ago and it was a blast for him. My “job” is blogging and child care for a toddler who’s Mom is a school music teacher so I’m blessed to get summers off. And for the first time ever I’ll be sending my oldest (12) off to a overnight camp. A couple at our church won a free week–so there really was no thinking about it. I’ve never herd of sibling camps–but I know it wouldn’t work with my kids AT ALL …at home I encourage free play A LOT and I think the structure of a camp will be great for my daughter. Thanks for the link to the bulling post to VERY HELPFUL!! I never heard of Sibling Camp. Is this a place they both go-or is it a stay at home and have older siblings essentially babysit their younger brothers or sisters? I’m a little confused! I like the idea of a sibling camp. I didn’t know they had those. Wow… thank you for the charts! I love the visual information and the helpful tips. I’m excited that you chose what will work for your children. I homeschool, so summer camp for me is another opportunity to socialize them. They are one year and seven days apart, so they are peers, which makes it easier. I will be checking out your bully-free camp tips. Thank you for the good work! You are very welcome Elayna. It is all about choosing what works for our children. That’s a great idea for your children since they are homeschooled. I guess I would have chosen this option in that case.